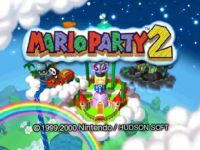 "Mario Party 2 (マリオパーティ 2, Mario Pāti Tsū) is the second in a series of board game style video games for Nintendo platforms, featuring popular Nintendo characters. It was released on the Nintendo 64 in Japan on December 17, 1999, following a North America release on January 24, 2000. It was released in Europe on October 12, 2000. This is the second Mario Party game for the Nintendo 64. Nintendo has confirmed that Mario Party 2 will be released for the Virtual Console in 2010 for all regions." Source: Wikipedia, "Mario_Party_2," available under the CC-BY-SA License.